During the spring 2013 elections, six students came forward to assistant Dean of Students Lucy Rojas, who also oversees campus elections, to complain of an inability to access the referenda and cast ballots. Denied login capability, the students were met by digital notices stating their ballots had already been submitted. The online voter registry procedure will now require students’ gold Cruz ID login and password, instead of their birthdates, to login and cast ballots. “The movement to the gold password for login to the ballot coincides with moving the ballot to a web application administered by our campus Institutional Research department,” Rojas said via email. A former Crown College Elections Commissioner representative and current SUA Internal Vice Chair Max Hufft said while he was campaigning last year, he saw a couple of cases where students went to vote and it said their ballot had already been cast. However, Rojas called the spring 2013 login issues a “one-time” mishap and said there were no complaints during the fall 2013 special election, which was held due to a mistake in the spring election. SUA Chair Shaz Umer said he discovered the systematic blemish in the online voting process prior to the spring 2013 elections through personal experience as a Residential Assistant (RA). Umer realized employees of all campus facilities had access to other students’ ID numbers and their birthdates, and he immediately made Rojas aware of the potential for voting scandal inherent in the voting login procedure. 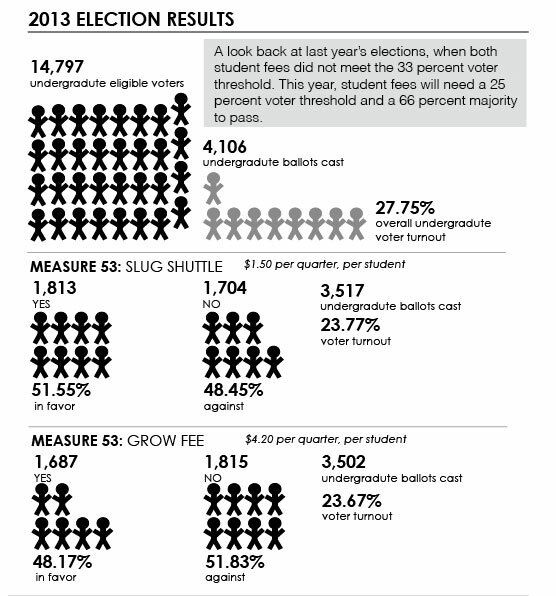 The entire voting system is in-house, said SUA Chief of Staff to the Chair Kelly Herron. None of UCSC’s online election technology is outsourced, which lends itself to small glitches and occasional login difficulty which Rojas and the elections committee quickly amended in the past. Implementation of the gold Cruz ID in place of students’ birthdates will address previously suspect voter security as a precautionary step to avoid problems with the voter login system that surfaced in last year’s spring elections. Herron concurred that RAs and other campus employees have had students’ birthdates and ID numbers at their disposal, but no UCSC employee has been recorded for violating sanctions pertaining to online voting. SUA elections begin April 30 at midnight and end May 6 at 11:59 p.m. Contact Lucy Rojas at larojas@ucsc.edu with any voting questions.